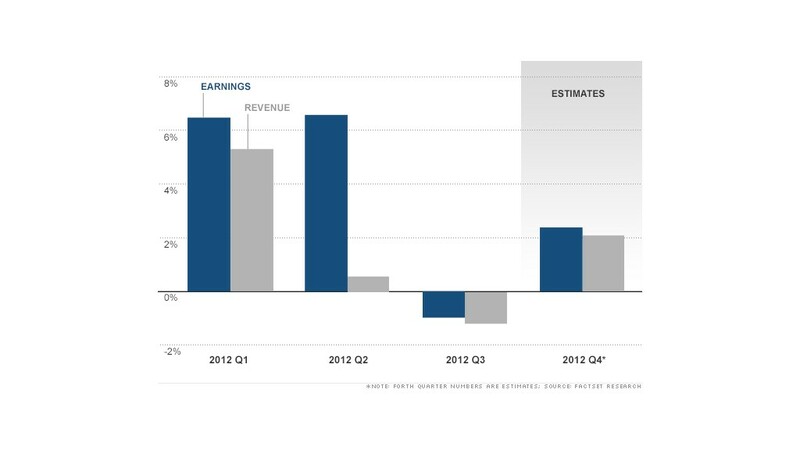 S&P 500 earnings are expected to have grown 2.4% during the final three months of 2012, with a 2.1% rise in revenues, according to FactSet Research. Following a lackluster third-quarter, Corporate America is starting to make a comeback. S&P 500 companies are expected to report overall earnings growth of 2.4% for the last three months of 2012, improving from a 1% decline in the third quarter, according to FactSet Research. Revenue is also expected to show signs of life, with FactSet forecasting an overall increase of 2.1%, though the actual revenue figures for the past two quarters have come in about a percentage point below forecasts, according to FactSet senior analyst John Butters. While a return to growth is a positive step, the latest earnings projection is sharply lower than the 9.2% analysts were expecting at the start of the fourth quarter. "Revenues are needed generate earnings growth, so it's important that they pick up," said Butters. The major factor behind the reduced expectations is the gloomier outlook from more than 70% of companies that issued guidance, particularly those in the technology sector, including Apple (AAPL), said Dan Greenhaus, chief global strategist at BTIG. Though the range of estimates is wide, the consensus among analysts polled by FactSet, Thomson Reuters and S&P Capital IQ is that Apple will post a decline in its quarterly earnings for the first time in more than nine years when it reports fiscal first-quarter results later this month. However, according to Estimize, a site that crowdsources earnings and revenue estimates from hedge fund managers as well as other so-called buy-side analysts, Apple earnings should increase by 5%. The financial sector is expected to be the standout this time around, with earnings growth of more than 15%, most likely helped by continued mortgage loan growth in the current low interest rate environment, said Butters. "Banks have had a lot of strength in their mortgage banking business, mostly on the refinancing side, and that's something we expect continued into the fourth quarter," said Butters. Banks have also been keeping costs down, said analysts at research firm SNL Financial, highlighting that Bank of America (BAC) is in the midst of a long-running cost-cutting program, while Citigroup (C) announced last month that it will cut 11,000 jobs as part of a plan to trim costs. Most of the major banks open their books next week, although Wells Fargo (WFC) will be the first to report this Friday. While the broad financial sector is expected to shine, insurance companies may take the biggest hit, with an estimated 40% year-over-year drop in earnings, largely due to losses related to Hurricane Sandy, said Butters. Excluding the financial sector, the earnings growth rate for S&P 500 companies is expected to be flat at just 0.2%. One of the biggest culprits during the fourth quarter was the fiscal cliff, which may continue to be an issue. "While the fiscal cliff battle ultimately ended in a modest deal to avert some of the worst consequences to the economy, the related caution, contingency planning, special dividend distributions and other distractions may have restrained business results," said Jeff Kleintop, chief market strategist at LPL Financial. Weak economic growth in Europe and slowing growth in emerging markets, including China, could also weigh on corporate revenues, said Butters. And that may keep a lid on earnings growth in the near term.